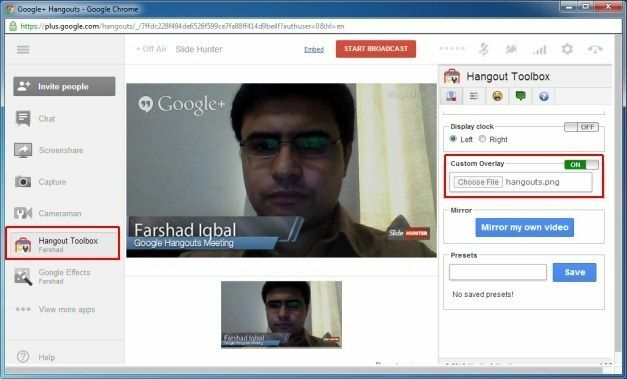 Google Hangouts is not just a tool for informal video chats but also for conducting business conferences online for company meetings, PowerPoint presentations, corporate brainstorming sessions and the like. 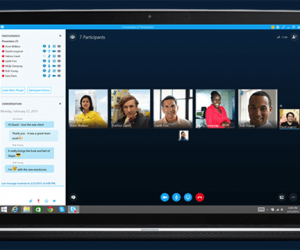 While you can conduct a conference using conventional tools, however, you can leave a more lasting impact on your clients if you are using a customized interface that can help you project your company’s logo on your Hangouts. 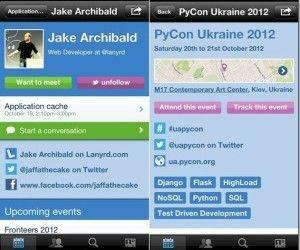 This can be done by using the previously reviewed Hangout Toolbox extension for Google Hangouts. Let us show you how you can create an attractive image overlay to display custom branding in Google Hangouts. 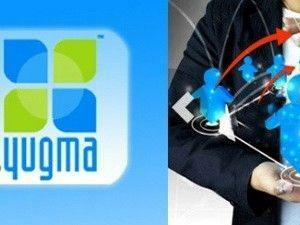 To create an image overlay with your brand and name, go to Hangout Magix (see link given at the end of this post). You will see a customization window where you can add your name/company’s name (Replace the word John Doe with custom text), select a style for your name strip, pick or upload your own logo and optionally change the color of your name strip. 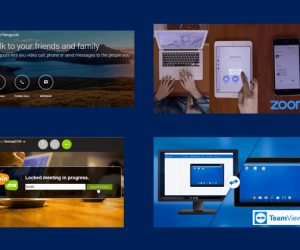 Hangout Magix provides four options for creating your custom branding, namely, Lower Third, Social Media, Call To Action and Sidebar. 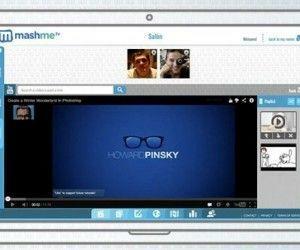 you can pick a branding format that best suits your video conference requirements. 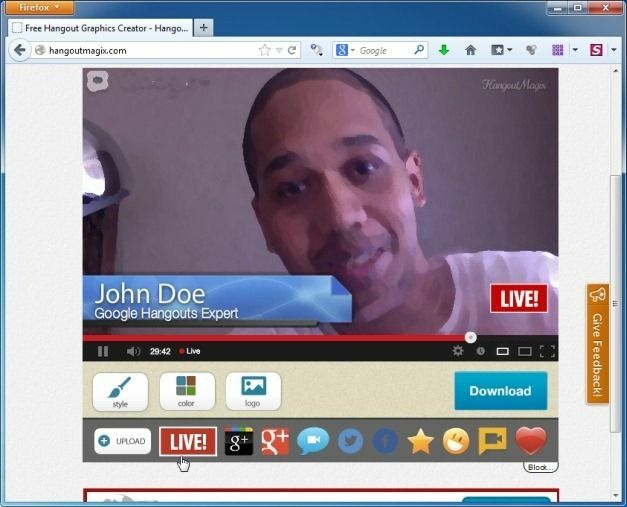 As you can see from the image given below, I added my name, a custom message “Google Hangouts Meeting” and added the SlideHunter logo. After you have made your overlay image click Download to save the PNG file. 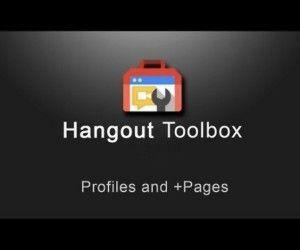 Now Start a Hangout and install the Hangout Toolbox extension. Once done, go to Custom Overlay, click Choose File and select the PNG file that you saved earlier. Move the Overlay slider to On and click Mirror My own Video to preview the changes. For a video demonstration of the above mentioned process, see the video given below. 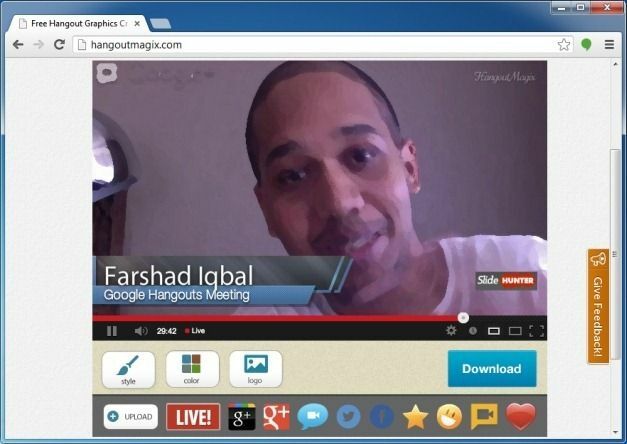 To create your own branding for Google Hangouts, try Hangout Magix.